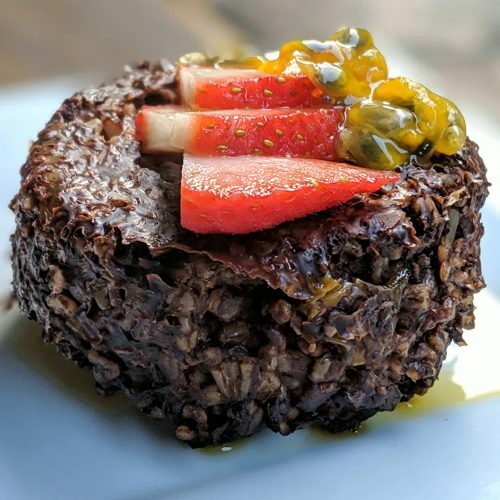 These vegan soft oatmeal chocolate cakes use the least amount of refined ingredients, no oil or butter, and no animal product. My kids love eating them. 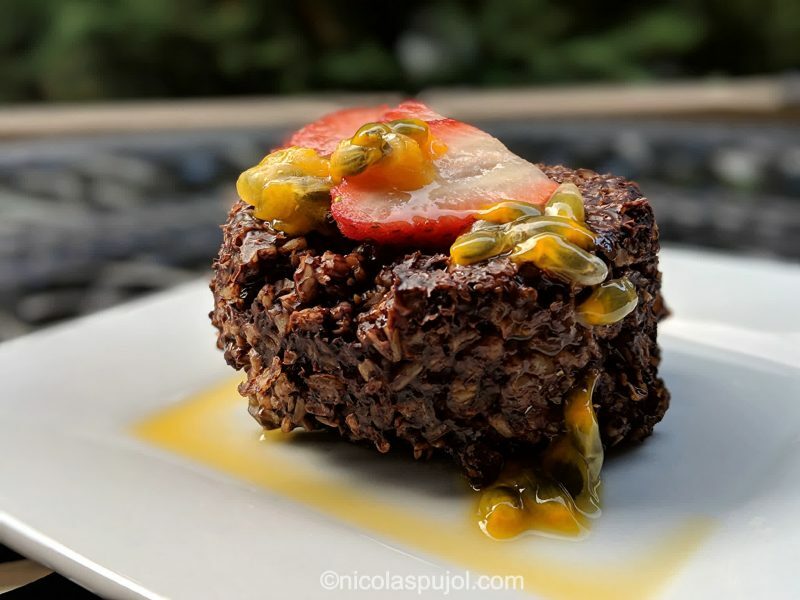 I did the first version of these cakes made of oats and fruits, using zero added sugar and cooking the oatmeal in water, and they turned out quite decent. 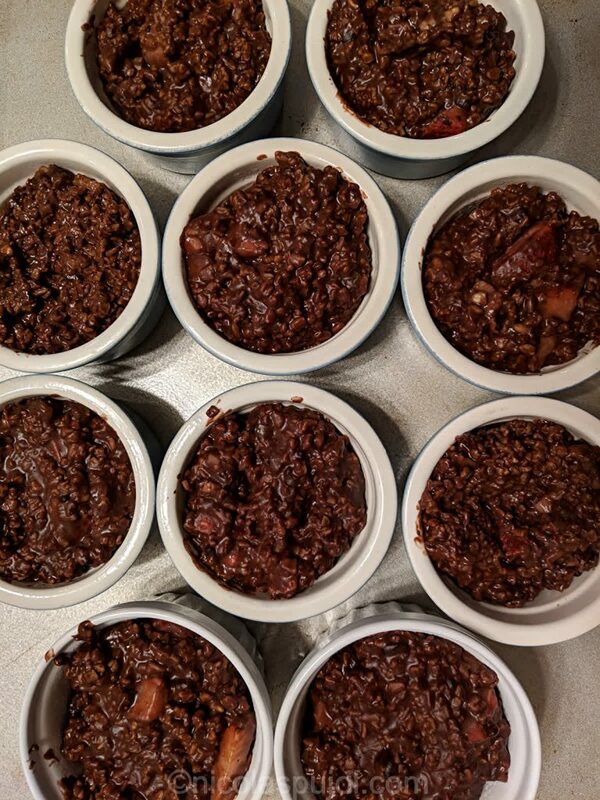 I test my recipes of course by trying them myself, and since I have two teenage boys, now 16 and 13, they help give additional feedback. I think the water-based recipe is fine for those looking for a high ratio of fiber no plant-based milk. 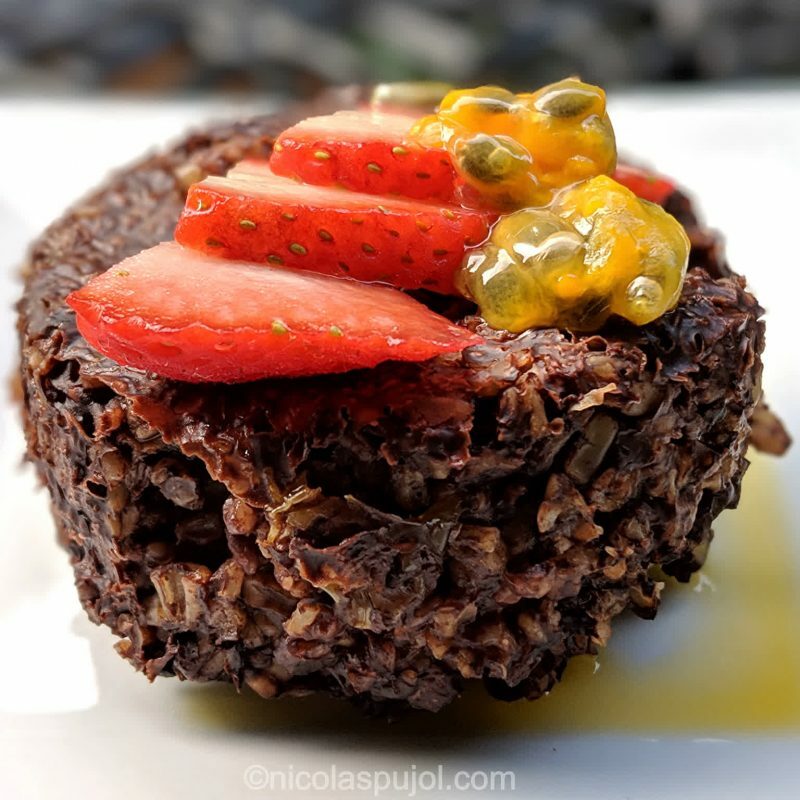 These oatmeal chocolate fruit cakes (strawberry, raisins) delighted the kids, as they are softer and slightly sweeter. Plus, we added fresh strawberry slices and passion fruit juice on top. When it comes to the presentation, the secret to making these cakes look polished is to let them cool down. If you try and unmold them as they come out of the oven, they will stick to the ramekin and lose their shape. But if you wait just 20 minutes for them to cool down, they will get slightly more compact and keep the perfectly round shape from their mold. The next secret is to flip them upside down. As you unmold them, place them on a plate bottom up, then decorate with fruits. 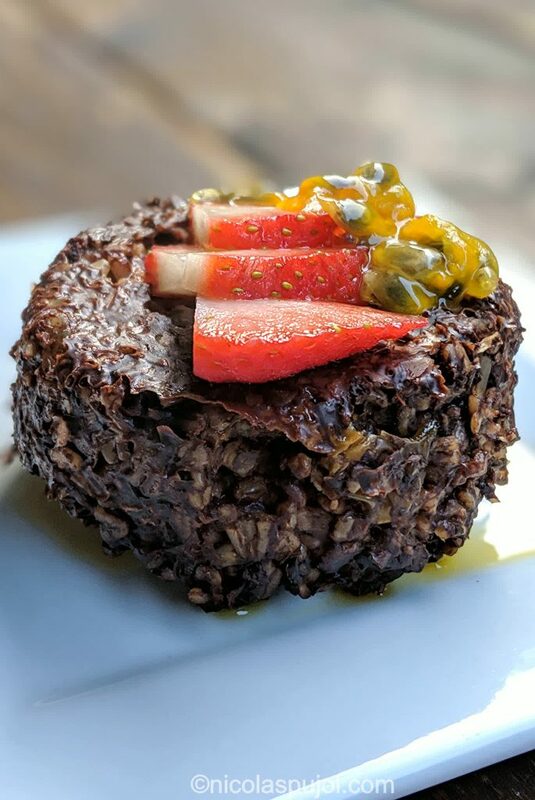 When looking for cakes without refined sugar (we use a small amount of brown sugar), without eggs, without yeast, without dairy and gluten-free, I think these “WFPBNO” (whole food, plant-based, no oil) cakes taste pretty good. They also make a fantastic snack before or after a workout. I hope you and/or your kids enjoy them as well! Let me know in comments. 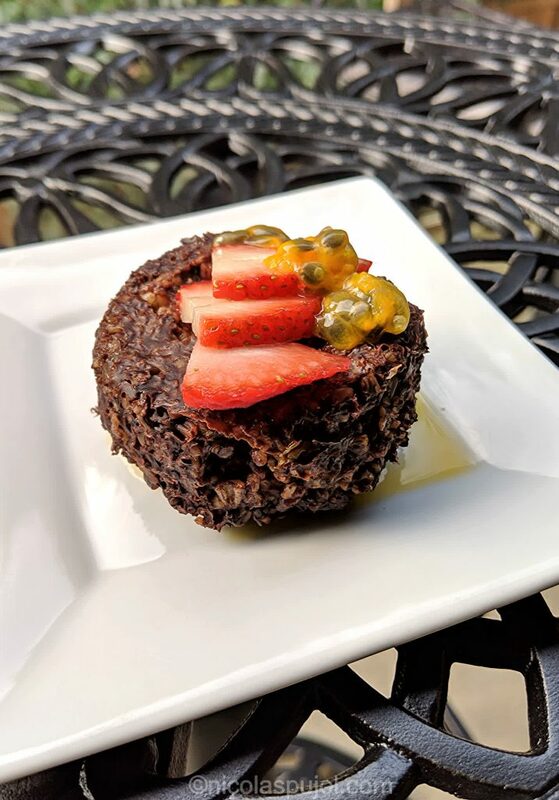 These natural oatmeal chocolate fruit cakes (strawberry, raisins) are made without yeast, dairy, refined sugar, gluten, or added fat. Kids love them. 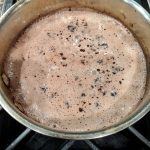 In a pan, add the almond milk, soy milk, brown sugar, vanilla extract, cocoa powder and oats. Mix the ingredients, bring the pan to boil then simmer for 8 minutes. In the meantime rinse and cut the strawberries in small pieces. Once the 8 minutes have passed, add the berries and raisins for 2 more minutes. Stir gently. With a large or deep spoon, transfer the oatmeal cake mix into the ramekins (about 10 for the above proportions). Place the ramekins in the oven. Bake for 35 to 40 minutes. Remove oatmeal cakes from the oven, let them cool down 20 minutes. Run a knife in circle around the inner edges of each ramekin, grab it and shake it upside down gently to unmold each cake. Put on a plate, slice strawberries (half a berry per cake), and pour the juice and seeds of half a passion fruit per cake as well.